Reception (or early flight to Arequipa). After breakfast, continue by land on your excursion towards the Colca Valley driving across Pampa Cañahuas at the Aguada Blanca National Reserve, habitat of herds of Vicuñas and stopping at the Mirador de los Andes, the Crater of Chucura, the Mirador de Chivay, where beautiful pre-Columbian terraces still being cultivated by native Collaguas can be observed. The highest point of the road is at 4350 m.a.s.l. Arrival to the Town of Chivay at 13:00hrs. approx. 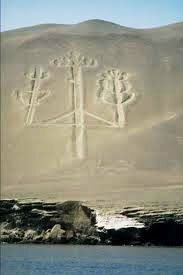 Transfer to your selected Lodge. Box lunch. In the afternoon free time to visit Hot Spring Thermal and Medicinal Baths. Early in the morning departure to the “Condor’s Cross” from where the great Andean bird, the Condor, may be spotted flying in circles above still farmed green pre-Hispanic terraces. Enjoy the impressive panorama of the Colca Canyon, one of the deepest in the World (3,180 mts.). On the way back to Chivay, visit to the Mirador of Chinina, where we will find the famous Hanging Tombs and the Hanging Bridge of Sifón that joins the Town of Yanque with Coporaque. At the Town of Yanque, visit its beautiful church and its characteristic cobbled stone streets among other attractions. 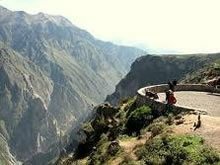 To have spectacular views of the Colca Valley, we will drive to the observation points of Choquetipo and Artahuilque and also to the Town of Maca. After lunch at a local restaurant, return to the City of Arequipa, arriving at 18:00hrs. Approx. Overnight at selected hotel. Breakfast. 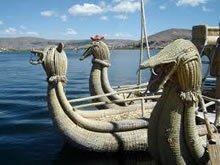 Early in the morning, we will have an unforgettable motorboat excursion on the waters of Lake Titicaca to the unique “Floating Islands” of the Uros. These ancient inhabitants of the Lake, known as the Water Tribe, have built their own “Islands” by periodically adding new layers of a type of reed called “totora” (Scirpus totora), vegetable fibre of the Papyrus family. Their homes and boats are also made from this material. We will continue our trip to the island of Taquile. This Island is known for having the best weavers of ancient Peru. 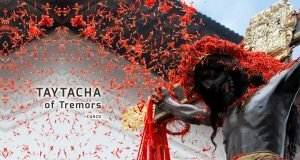 This place has preserved many rituals and the lifestyle of the ancient Incas. We will walk for about 30 minutes to the center of the island and will stay there for 3 hours and have lunch. Then we will descend 500 stairs. We will leave to Puno at 04:00pmIn the afternoon, return to Puno. Evening free. Overnight at selected Hotel in Puno. Breakfast. Early departure by bus to the City of Puno, (3,860 m.a.s.l.). During the trip, we pass by the lovely Wacarpay Lake, offering spectacular views of the mountains reflected in its calm waters. We proceed to the beautiful Town of Andahuaylillas, and visit the Church of San Pedro de Andahuaylillas, better known as the Sistine Chapel of the Americas, due to its decorated polychrome ceiling. On the way, we stop in Raqchi, where we can see a spectacular Inca Sanctuary built by the Inca Pachacutec, and dedicated to the great Inca God of Wiracocha. 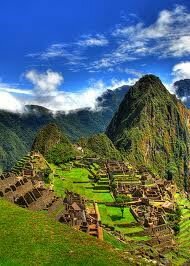 It has a great central wall with a stone base of fine Inca architecture. Other walls are made of giant adobe bricks. The structure also has two circular lateral columns. Around the Temple are several buildings once used for housing and storage. About 70 km further on, we pass through La Raya Ranch where we can see herds vicuñas and llamas. Then we travel along the High Plateau of Collao, stopping at the Town of Ayaviri, an important livestock and textile centre, to visit the impressive Temple of Kalasaya, ruins from the ancient Pucara Culture. Buffet lunch in a countryside restaurant, where we can enjoy the delightful culinary art of the region. Afternoon arrival in Cuso and transfer to your selected Hotel. Evening free. Overnight at selected Hotel in Cusco. Early morning excursion to the Urubamba Valley, the Sacred Valley of the Incas. Visit to the picturesque Indian Pisac Market held on Tuesdays, Thursdays and Sundays, the shopping paradise of the Andes where barter is still practiced. Enjoy the unique atmosphere during a typical lunch. In the afternoon, passing through the Towns of Calca and Urubamba, we visit the Inca Fortress and Citadel of Ollantaytambo, built to guard the entrance to this part of the Valley, and protect it from possible invasion from the tribes in the Lower jungle. You can walk through the quaint streets of the nearby Town, and get a good idea of what this Strategic Military, Religious, and Agricultural Centre was like during the era of the Inca Empire. On our way back to Cusco we stop of at the picturesque Andean village of Chinchero to visit the ruins of the Royal Hacienda of Tupac Inca Yupanqui. We will admire a well-preserved Inca Wall in the Main Square, and visit the beautiful Colonial temple built on Inca foundations, with interesting frescoes in the portico. Late afternoon return to your selected Hotel for overnight. Evening free. We suggest strolling around the Main Square and enjoy the night atmosphere trying a delicious Pisco Sour in some of the many pubs around the Square. Note: The visit to the Village of Chinchero depends on the time available. Pisac Market only Tuesdays Thursdays and Sundays otherwise a visit to Pisac Incan ruins will be scheduled. Price subject to change based on in country airfare changes and availability. Only 50% deposit required to secured space and rate.